**Side note, I recently arranged an aerial photo shoot of a new listing with a company that uses an RC drone to get the images. They obtained some fantastic shots of a new listing here in Marsh Harbour – check it out, European Luxury and Tropical Caribbean Flair. http://www.hgchristie.com/details/abaco/marsh-harbour/house-as12275. Nice Job and shout out to Sky High Media. How similar is the Bahamas Real Estate Market to the US Real Estate Market? Well for starters, 2 years back I had read from the National Association of Realtors, that the most common house colour of homes that sold was yellow so I decided to find out if that held true in the Bahamas. And guess what, it is the number one colour of homes sold in the Bahamas, by a very large margin. Go figure. The number 2 house colour was blue, which is my personal favourite choice for a home. So, does this trend extend to our little real estate market as well? Thanks to having a proper Multiple Listing Service here in the Bahamas, I am able to tease out some real data on our market place. Prior to 2008, there was no data sharing, no listing sharing among real estate brokers in the Bahamas. Trying to figure out the dynamics of the real estate market in the Bahamas either came from straight up guess work, or from decades of experience in the business. Most decisions and value assumptions were performed inside a small bubble based upon the experience and results of one’s small sphere of business. Now, the Bahamas Real Estate Association has full embraced the 21st century and on the cutting edge of real estate. Most recently gaining a datafeed portal to the Realtor.com website. Now prospective buyers can go to the number one real estate portal in the US and search for real estate in the Bahamas. This was a massive step forward for the industry in our ‘backward little country’ (I say that having intimate knowledge of my home, and how we function, and some chagrin at how some things get handled here in my beloved Bahamas). The Bahamas MLS is the number one tool for selling real estate in the western world, and has already become the main tool for buyers and sellers of land and homes in the Bahamas in just under 5 years of existence. Now to the point, I analyzed the number of real estate sales that were placed under contract during each month as recorded on the Bahamas MLS over the past 5 years to date, and what I found, interestingly supports the trends in the USA. Perhaps our love affair with our great neighbor to the north has an influence, or maybe it is just fundamentally a byproduct of our school year, fiscal year and indeed April is one of the most beautiful months of the year in the Bahamas. The seas warm up, the air temperature is not stifling hot yet, the Poinciana trees start to bloom in May. We have a few showers to bring out the green in the landscape. 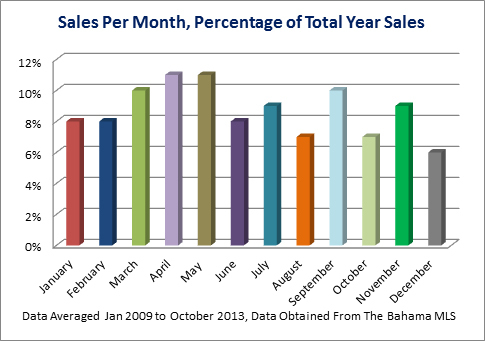 The busiest real estate months in the Bahamas are April & May, closely followed by March and September. More generally speaking, the Bahamas real estate market is doing ok. Nassau is definitely seeing a return to a strong and stable market and economy, which I believe is largely a result of geography, being a densely populated metropolis with a large number of visiting tourist and most especially being propped up by the large scale development projects of Bahamar and Albany. And to a lesser extent the Balmoral project is turning a long at a good clip. On the flip side, the other islands of the Bahamas have had a struggling year. Abaco’s struggling market I know about first hand, while my colleagues in Eleuthera and Exuma and Grand Bahama are seeing a similarly flat market. It is a shame because the lesser developed parts of the Bahamas rely on the real estate component of their economy very substantially, and when real estate drops off it hurts every other sector of the micro economy. Real estate on our family islands drives the incomes of at least half of the economies of the small settlements scattered around outside of the big city Nassau. We don’t have large resorts to bring in mass tourism. When real estate sales activity dries up in Abaco, air travel drops, the restaurants suffer, hardware stores and grocery stores struggle with turnover, it impacts taxi drivers, ferry drivers, boat and car rentals, folks who caretake homes and handle vacation rentals. Even the lady that cuts my hair says she sees her bottom line affected when the real estate market in Abaco drops off. I would propose that the pending implementation of VAT (purported to be 15% of all sales in the Bahamas) is having a strong negative effect on the real estate market in the Bahamas and all other parts of the economy. No one likes to see taxes raised, and when there is an uncertainty, any element of the unknown in the future financial realm it directly affects people’s confidence. When the confidence is impacted, then prospective buyers or investors, hold off on making large decisions, ie buying or selling real estate. For instance, I don’t know how this VAT will affect the economy, my life, my financial bottom line. I don’t know what the fall out will be and how long it will take to smooth the hiccups. As a result, I’m not going to take any unnecessary risks. Similarly the level of tax burden has gone up significantly in the Bahamas over the past year, and everyday Bahamians see it and feel it. So when taxes go up, spending and borrowing drop almost immediately. So when someone asks me about ‘How’s the real estate market these days?’ – I tell them it is pretty rough, everyone is in a holding pattern to see what the present government will be doing. It is difficult to try to plan a new project of business venture when you don’t know what your cost of goods is going to be in 3 months, 6 months, a year from now. So, I hope that things will settle down, I hope we will see a steadier, more predictable business environment to work within soon. I for one would like to see less rocking of the boat. Good read Dwayne. As developers, we share similar concerns about the new tax plans. The future of real estate and development is clearly in the family islands. We should connect down at schooner sometime to discuss further. I am also interested in working with the aerial photography group you featured. Hi Carter, Thanks for leaving a comment. You guys have a great thing going in Schooner Bay, I need to head down and see the recent work especially the roads going in. The new taxes are something that we should all be concerned about. D.